The "Millennium Miss Piggy" is here -- a new Franklin Mint porcelain doll celebrating the millennium in high style! This 14 and a half inch doll is authorized by The Jim Henson Company, and it's the first time that the Franklin Mint has ever produced a Muppet doll in its series of expensive collectible knick-knacks. The doll offer was announced in an ad in the USA Weekend newspaper insert on Memorial Day Weekend. Here's the text of the ad: "Celebrate New Year's Eve with 'Moi': Brought to life in hand-painted porcelain... A Vision of porcine perfection, Dressed in a rich velvet 'haughty couture' gown, And adorned with designer jewelry and real pearls. 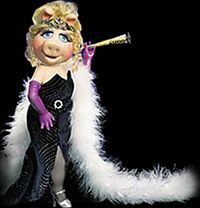 "Celebrate the new Millennium with Miss Piggy -- everyone who is anyone will be there! Just $195, payable in convenient monthly installments." Those convenient monthly installments end up being 5 installments of $39 each, plus state sales tax and a one-time charge of $4.95 for shipping and handling. The first payment is due before they'll send a doll to you. A little pricey? You bet! But this is the first full-sized porcelain Piggy since Enesco's Cleopigtra and Marie Antoinette dolls in the mid-80's -- and those are now selling for hundreds of dollars on on-line auctions. Here's a little more description of the doll: Piggy is standing in a flirtatious pose, with one fishnet-stockinged leg emerging from the slit in her black-and-silver dress. She's holding a large gold noisemaker that says "2000." Her hair is curled and piled on her head, and she's wearing a silver tiara. She's got pearls, purple gloves, a white boa and silver high-heeled shoes. The downside is that, pictured in the ad, her eyes look a little off, giving her a slightly blank expression. And now, the important part: To order a doll, send your name, address and telephone number to: The Franklin Mint, Franklin Center, PA, 19091-0001. Tell them to "enter your order for Millennium Miss Piggy," and they'll send you your first bill. Unfortunately, there's no phone number or web address on the ad.